Talking to young Egyptians, many complain the country has little to offer. 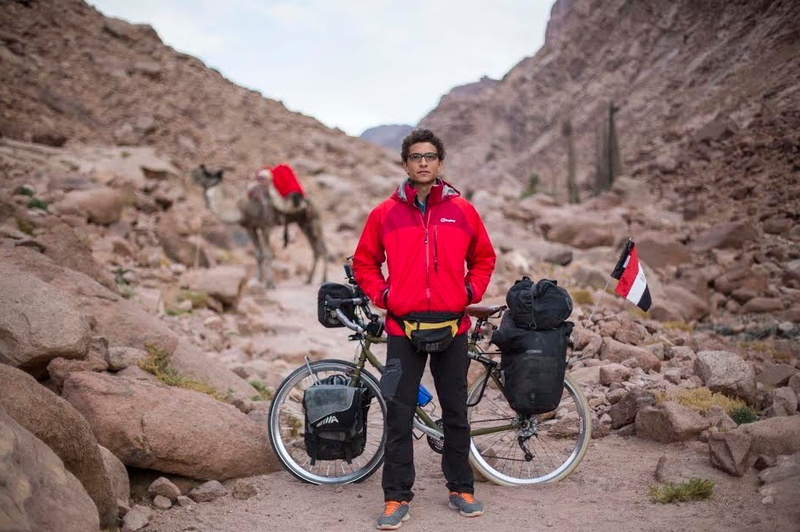 Yet, Galal Zekri Chatila, dubbed as Egypt’s youngest solo cyclist, is on a mission to showcase to Egyptians and to the world the country’s unseen heavens by cycling 7,000 kilometers across Egypt in just four months. 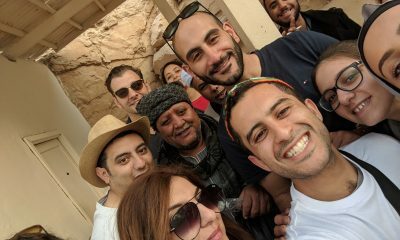 Egyptian Streets talked to Galal during his inspiring tour across Egypt to learn why he decided to undertake this enduring adventure and to learn more on why people should get out and see more of the country’s hidden gifts. Firstly, if you can describe yourself in one line, what would that line read? 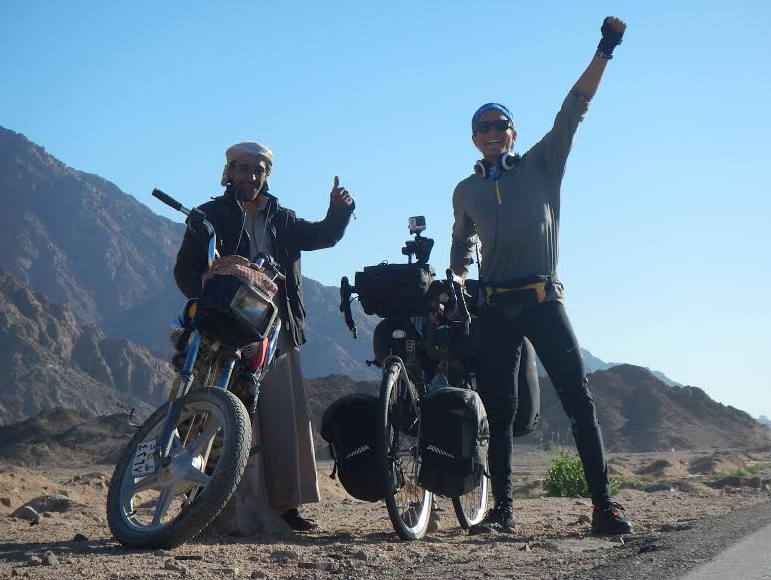 A young Egyptian adventure traveller and a filmmaker who is looking forward to encourage others to get out of their comfort zones and to break their limits. 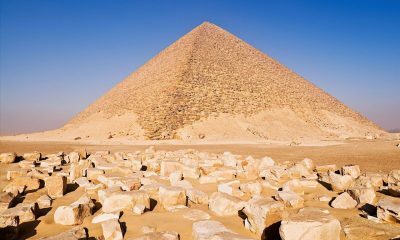 What inspired you to undertake this solo tour around Egypt? What made you wake up one day and say: I want to try riding around Egypt! It’s a long story here. It all began when I was a kid, I used to dream of becoming a traveller on a horse. Having my tent and my dog, I can have the best home on earth, which would be everywhere. But when I grew up I was shocked to realize that we can’t be as free as we want to be; we have rules, barriers, and some societal boundaries that wouldn’t let us go as crazy as we like. The dream was always there until one day I joined my school on a trekking trip from Cairo to Suez. I was 14 years old back then, and it was a hard challenge to go through such a tough experience but I finished that trip. 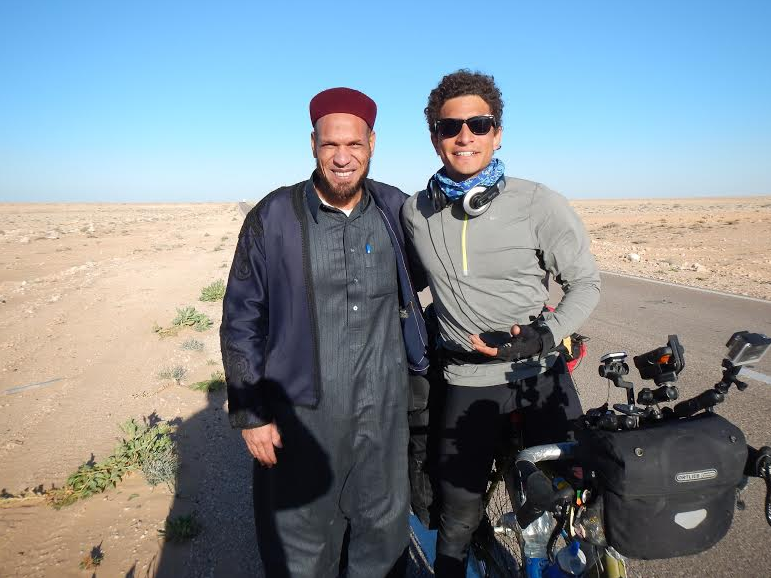 The second time I went on another one was to Ismaelya by bicycle, which seemed to be more convenient for me than walking, since I can cycle 100 km in six hours, but only walk 25 km a day. This ambulance car decided to stop when it bumped into my way to Saloum. 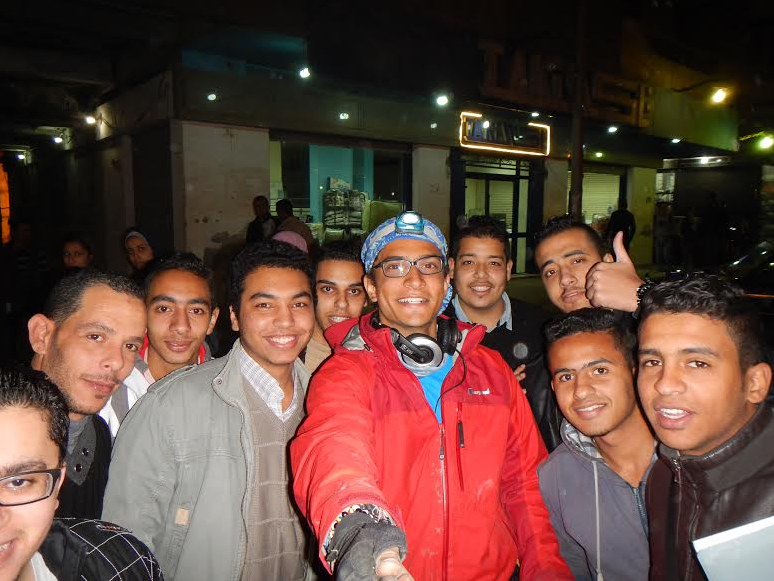 They knew that I was the guy who is touring around Egypt by bike, and they decided to take a picture with me. 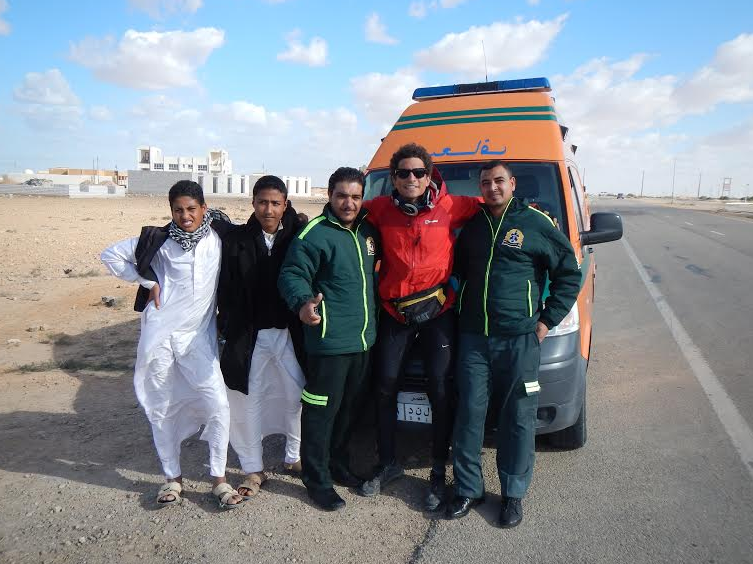 So after these two experiences, I decided to take my bike and go to Sokhna. The challenge here was that it was back when the [January 25] revolution started and I wanted to ride on my own. Cairenes kept on saying that the roads are full of thugs, and it would be unsafe to go there on my own by bike, but I wanted to prove them wrong, and I just took the risk and hit the road. 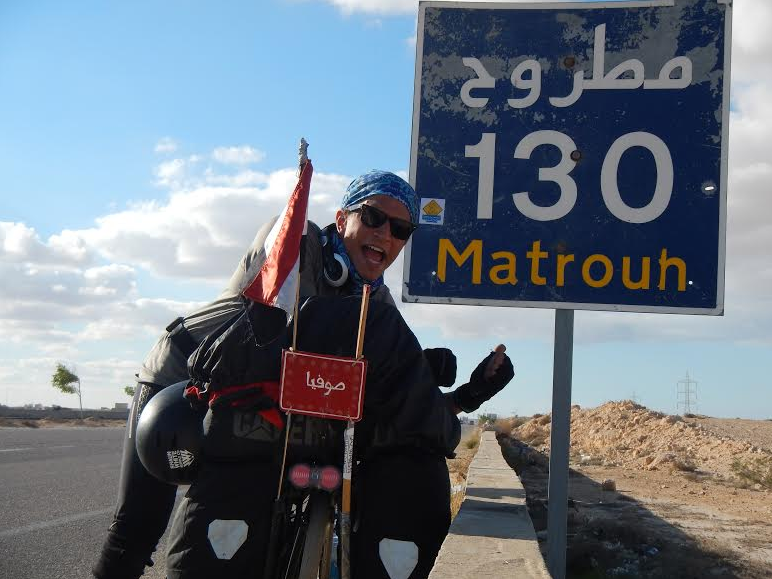 Reaching Sokhna in seven hours encouraged me to go on bigger trips, and I did achieve the impossible: cycling to Nuweibaa for 450 km. That trip made me believe that this country is incredible, and people are afraid of the unknown, and they need someone to encourage them to overcome this fear. When I was on my way to Siwa, i met the Sheikh El Kabila Omar Rageh. Just shaking hands with this man made me feel the peace that lies within such an oasis. So after achieving my first goal I summoned the power to think of touring Egypt, but I had to test myself: spiritually, my physical endurance, filming skills, and lots of other stuff in order to grow bigger and be more professional in what I love to do. And you then went on a trip in the Western Desert? Yes. 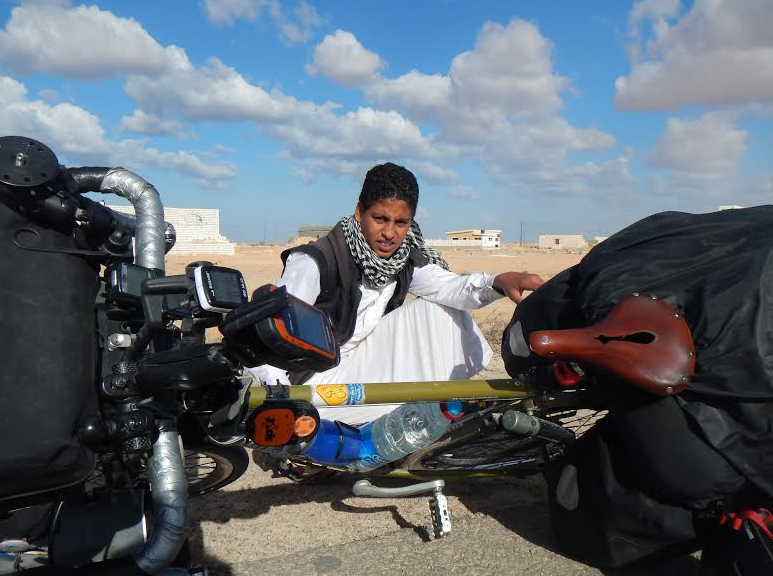 It was my first time to get a bike in February 2013, and I managed to tour around the four oases of the Western Desert (Baharia, Farafra, Dakhla, Kharga). The trip covered 1650 km in 19 days. After completing that last trip in May 2013, i decided that I owe this beloved country a lot, and I would do anything to prove to its people that this country is epic. 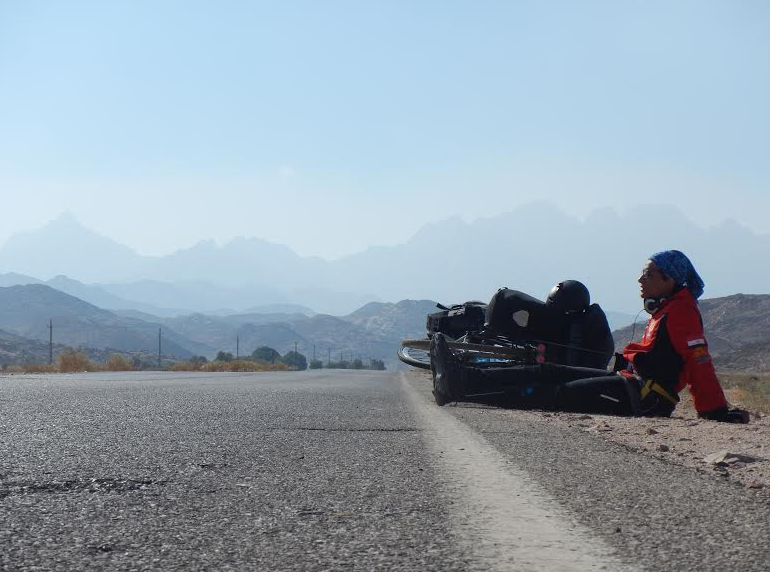 Why are you cycling across Egypt? 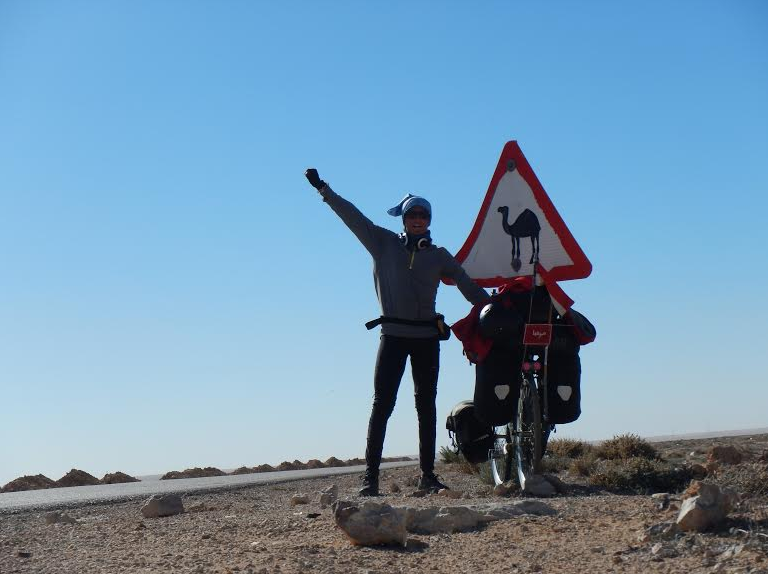 I’m cycling across Egypt because first I’m fulfilling a personal dream, and because I’m trying to build my career in the adventure travels field to become a TV adventurer and/or lead adventure traveling. The other reason is to showcase to Egyptians and to the world the unseen heavens of our dear beloved country. The diversity of its nature and the hospitality of its people are one of the key elements that would be enough to encourage people to travel within its boundaries. Encouraging the youth and showing them that nothing is impossible, and that this country deserves our appreciation, is a big goal that I’m planning to achieve through a movie I’m producing, photos and a book as well. What is the biggest challenge you’ve faced since starting the tour and during the tour so far? It was extremely challenging to get on the road on the first place, because I wanted to get the maximum benefit of such an encounter. I had to deal with several ministries, television channels and sponsors, which usually take too much effort and time. But I was glad to build this project of mine in just a year and a half in order to be able to tour Egypt while having the support of over 30 entities. During the project, I had to face the fact that I had a knee problem, and then I had to overcome some inner conflicts. And once I managed to feel the road and the wilderness, the only challenges were flat tires, high speed head-winds, uphills, some bureaucratic procedures to cross the closed roads. Has anything ever made you rethink the tour, perhaps to end it early? Never, ever. I am actually considering staying for more time on the road. Egypt is seriously an awesome country, and the diversity of its places is incredibly astonishing. Can you tell us a little about what the essential equipment you need for a tour like this are? What, apart from your bicycle (and obvious nutrition), could you not sacrifice? Well the essential equipment for such a journey is first the spirit and the will. If you don’t have any of these, you’d better work on reviving your life. 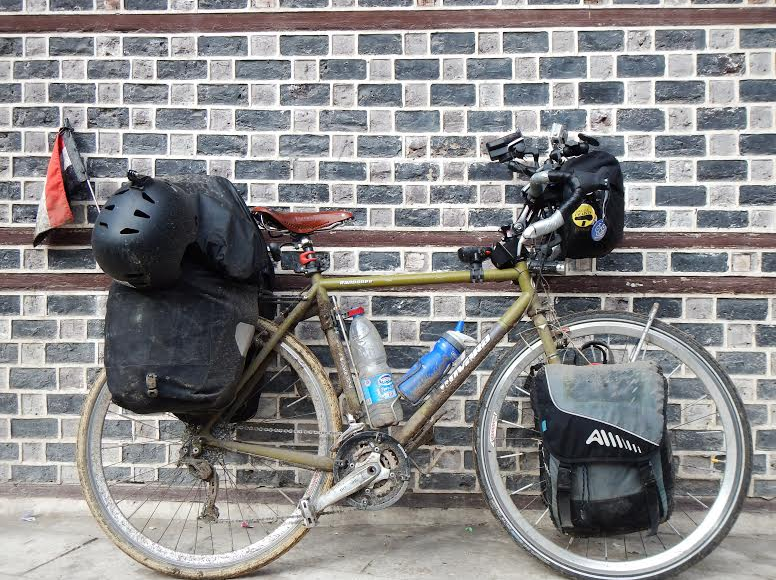 My equipment is divided into: biking, camping, nutrition, navigation/telecommunication, energy, filming and safety. For the biking, you will need a good touring bicycle that can have a front and a rear rack on which you can place your panniers. A pump, spare inner tubes, spare outer tube, spare chain, and a good toolkit are essential as well. I am not into helmets; but you must have one, you never know the conditions of the roads that you face. For the camping, I have a tent, a sleeping bag that can contain me when it’s below zero degrees Celsius, a thermo-rest camping stove, a pan, and toiletry. For the nutrition, I usually have loads of snacks on the front pannier (nuts, dates, biscuits, fruits, etc.) and I often go for rice or pasta with any kind of protein at night. I don’t ollow a diet because I don’t considering myself a professional athlete; I am more of a traveller, so I eat whatever is on my plate. Unfortunately tuna cans are my best friend. For the navigation and telecommunication, I have a Thuraya Satellite phone so that I can stay in touch with my back office in Cairo. All my bags, and myself, are also tracked with GPS devices to ensure my safety, and I have a backup team in charge of following my every update. I use a GPS for Navigation, but sometimes it breaks down, so I usually have my maps in hand. For filming, I carry three cameras, a tripod, several battery packs, several memory cards, a hard disk, a sound recorder, and a zoom mic. For energy, I have several power banks 10.000 maah each, a solar panel, and lots of cables to charge all the gadgets . For safety, I carry a full first aid kit, and a spot assist device to send an emergency calls to my rescue team in Cairo. Where has been your favourite spot so far? Any places you discovered or visited that people must go to themselves? EVERYWHERE IN THIS COUNTRY IS A MUST VISIT PLACE. SERIOUSLY THIS COUNTRY AND ITS PEOPLE ROCK. I can’t promote a certain spot per say, but if you ask me where would you like to build your dream house, I would tell you Sinai/St. Catherine, Marsa Allam, Dakhla, and Siwa. As someone who has been travelling across Egypt on a bicycle, is Egypt safe? It depends on what does safe mean to you. Is your home safe? No one is safe on this planet, there is always a risk. God created good and evil, and that means that the answer for such a question will never be a Yes or No. But if you want my share of experience, this country is safe because of its people, their goodness, their kindness, and their incredible hospitality. When I was a kid, like four or five, but I don’t think it will ever make a difference because now I am not riding a normal bicycle; I am riding a touring bicycle which is completely different, so I learned to set sail on the desert roads when I was 15. There are many people who have certainly been inspired by your work. For anyone hoping to follow in your steps, what are five tips you would give them? You build yourself; don’t even expect that your family will help you. Surprise them and let them believe in your passion. Be proud of yourself when you follow your passion. Never give up, you must believe in yourself. Put it in your head that when there is a will, there is always a way. Learn how to carry yourself because it’s very rare to find someone to carry you. Follow your heart in every single step you make in your life/your route, and be wise. Don’t take things in a rush. Think deeply before you risk your life, and go for the risk only when the cause deserves it. People will never believe in what you do until you prove them wrong, so don’t surrender to the bad vibes that you will get from any desperate souls, and never underestimate neither yourself nor others. Trust the real Egyptians in your life; they are incredibly kind and awesome, but always take your precautions because you never know what lies behind a smiling face. 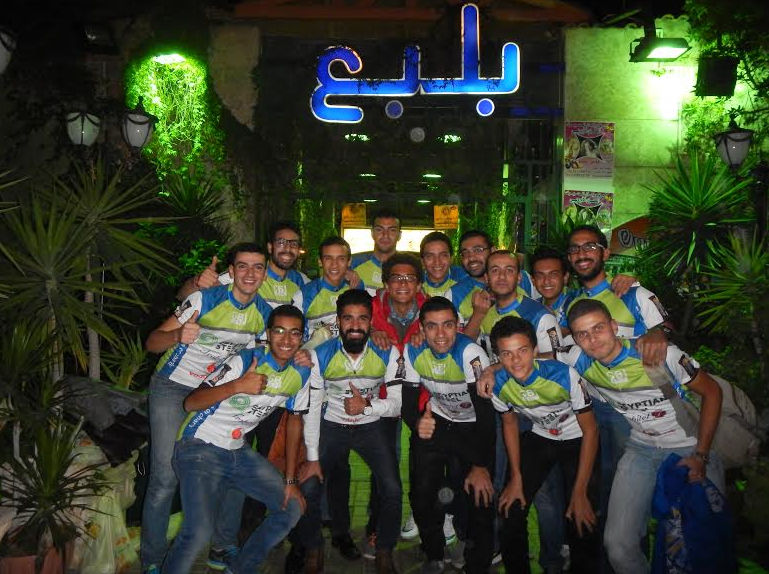 Can cycling be the future of Egyptian transport? Hahahahaha! Since I am a Cairene, I am actually surprised that bicycles aren’t means of transportation yet. People say that our streets aren’t made for them , and I actually see that our streets aren’t even made for cars or pedestrians. I think that our materialistic friends will think about getting bikes when the price of fuel becomes even more expensive, and when they start to spend more than 3 hours to cover 5 km. As for Egyptians traveling by bicycle, I think it will definitely come by time once we start believing in how great and gorgeous our dear beloved country is. 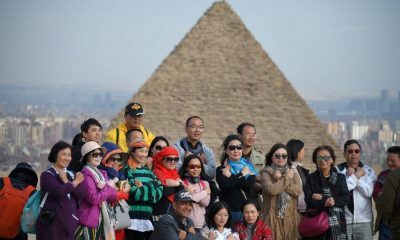 How can Egyptian Streets’ readers learn more about your tour and be able to follow you? Seif El Mashad contributed to editing of this piece.